Food & Wine How do I make the perfect pastry? How do I make the perfect pastry? Pastry is one of life’s little mysteries. It strikes fear in many people’s hearts. How do some create pastry that is crisp and flaky, while others produce tasteless cardboard? The first rule is not to be nervous. The hands of nervous pastry makers can get warm, and heat is the bane of perfect dough. The second rule is to handle the dough lightly. If pastry is overworked, or if heat is introduced, too much gluten is developed, and the dough becomes tough. When it comes to ingredients, use all-purpose unbleached flour, organic if you prefer. And measure accurately. Although butter makes the best tasting pastry, it doesn’t create that flaky, melt-in-your-mouth texture. Adding a little organic vegetable shortening gives me the texture I want. I like to use 75 per cent butter and 25 per cent shortening for savoury pastry and all butter for desserts. Use unsalted butter, as it has less water than salted. The higher the proportion of fat used, the crispier and tastier the pastry, but more fat also makes the pastry harder to roll out, because it is so delicate. Pat out high-fat pastry instead. Bind the flour and fat together using water, wine, citrus juice, beaten egg or a combination. The liquid should be ice cold. A tablespoon of white vinegar or lemon juice mixed with the water makes a flakier dough. 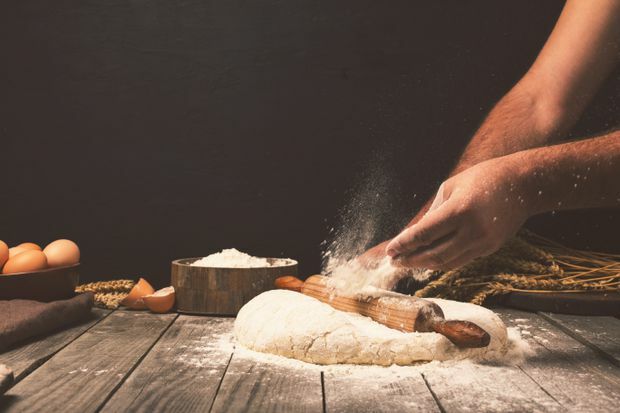 To make the dough, cut the fat into the flour with a pastry cutter, two knives or your fingertips until the mixture resembles coarse breadcrumbs. Sprinkle the liquid over the fat/flour mixture. You need just enough to hold the pastry together. Gather the pastry into a ball with your fingertips. It should hold together but not feel sticky. To roll out the pastry, lightly flour the counter, as well as the top of the pastry. Flatten the dough a little by pressing with the rolling pin, and then, starting in the centre, roll gently to the edges, using light but firm strokes. Occasionally turn the pastry in a circular motion to keep it from sticking. Roll the dough about 3 mm (1/8-inch) thick, making sure it is enough to fit your pan. When transferring the dough to the pie plate, wrap the dough gently around a lightly floured rolling pin. Place the pin over the top edge of the pie plate and unroll the pastry gently. Roll some excess pastry into a little ball and use that to gently press the dough into the pan. This works better than your warm fingers, which can more easily tear the pastry. Make sure the dough reaches into all corners of the pan and up the sides to account for shrinkage. If the pastry tears, moisten the spot with a drop of water and patch with some extra pastry. Freeze the pastry in its pan for 30 minutes. It bakes better when taken directly from the freezer. And always bake pastry in the lower third of the oven to make sure the bottom crust is properly cooked. How do I maximize space in a small kitchen? How do you properly prepare asparagus?